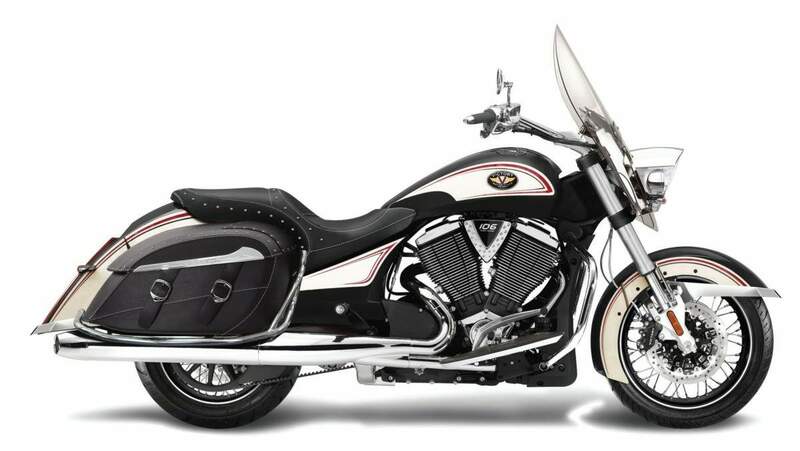 The Victory Cross Roads Classic LE will satisfy riders with either hard of soft bagger tastes. For 2012, the custom program allows you to personalize your Victory Cross Roads Classic LE touring motorcycle 48 different ways, right at the dealer, right when you buy it. Order, customize, drive - no waiting, no worries. You get to pick your color, saddlebag style, windshield style and tip over protection - there's over 48 different customization combinations for these touring motorcycles. You don't waste time waiting for parts to be delivered, or wasted stock parts that you just remove once you get the bike. You'll be out on the road enjoying the power and customized style of your Victory Cross Roads Classic LE before you even realize it. The Cross Roads Classic LE touring motorcycle looks just how you want it - but it performs just like a Victory. That means you get the benefit of world-class performance wrapped in a custom shell. The Freedom 106 V-Twin engine that produces a road walloping 97 horsepower is still inside, no matter what color you chose. We don't offer hot pink, but if we did, this bike has the muscle to back it up.